Its a great way to waste some time get some inspiration for your own next project, especially if your knitting mojo has deserted you or you're in between projects. 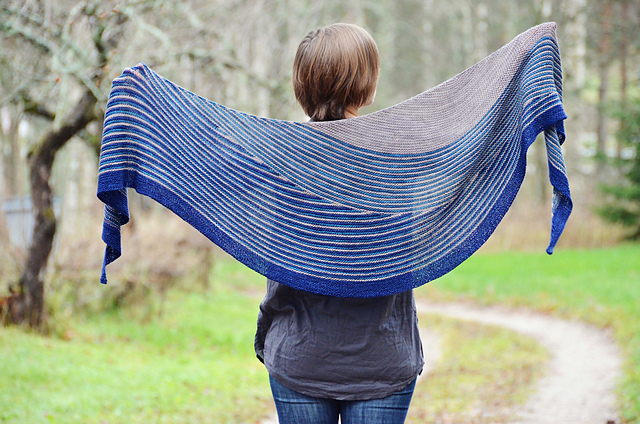 One pattern that keeps on coming up again and again in recent months is Color Affection by Veera Valamaki. The pattern is available in 4ply and laceweight versions and is all garter stitch. Its uses short rows to shape the shawl. The pattern is available to buy online through Ravelry for 3.90 Euros. Our Debbie Bliss Rialto Lace or Debbie Bliss Angel would be great in a laceweight version. Or how about one in our Rowan 4ply Wool or Jamieson's of Shetland Spindrift? We now have shade cards for Jamieson Heather! £5 with real yarn 'tassels'. And yes it is a lovely shawl...! Highly recommend.